GOOD FOOD GUIDE AWARDS 2018 - NOMAD AWARDED ONE HAT! We are thrilled to announce we have been awarded One Chef's Hat for the fourth year running. 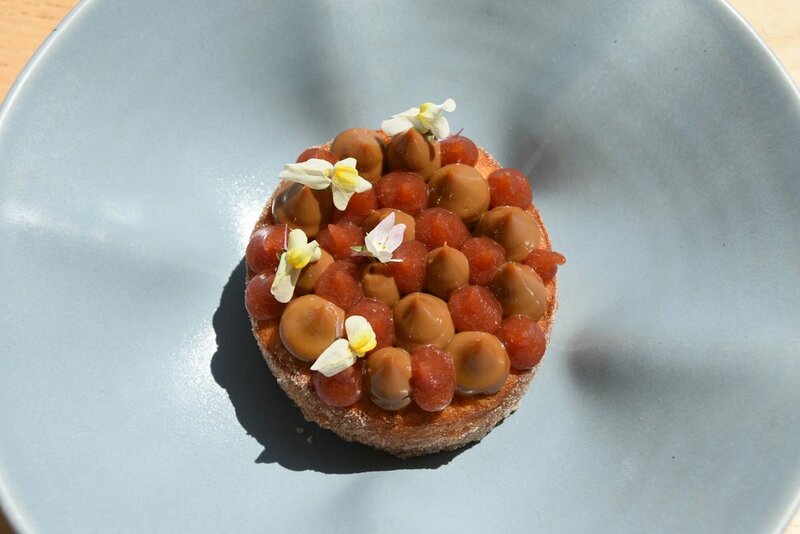 A huge thank you to our team at Nomad whose hard work, dedication and talent is behind retaining our Chefs Hat, along with our wonderful suppliers who ensure the quality of our produce and wine is the best Australia has to offer each and every week. We couldn't do what we do without the support of our diners, the reason we strive to bring you the best. Cheers! A first for us and for you! NOMAD is collaborating with our favourite Mediterranean eateries, Kepos Street Kitchen, Redfern and Lox Stock & Barrel, Bondi Beach. With St. Ali coffee and brunch appropriate cocktails coming from the bar this is not to be missed. Click here to reserve your table, we open from 10am. The flavours of Chile are coming to NOMAD next month, when Chilean duo, sommelier, Dennis Roman (ex- Café Paci) and chef Alex Munoz (formerly of Monopole and Cirrus) join head chef Jacqui Challinor for an all-out Chilean food experience with a heavy dose of heat on Monday 25 September. For Chilean-born and raised Alex, it’s a chance for him to showcase the food of his childhood. “Globally, we’re starting to see more of an interest in Latin American food, but the focus is largely on Mexico, Argentina and Peru. I’m excited to shine a light on traditional Chilean cuisine and the food I grew up eating. I want Sydney diners to experience those dishes, in a more contemporary style,” he says. While Alex and Jacqui man the Asado, Dennis will turn NOMAD’s all-Australian wine list on its head with a matched selection of Chilean-inspired cocktails and wines from Chile. “As a proud Chilean, I’m always looking to expose more people to the diverse and vibrant nature of my country’s wine. The wines on offer on the night will boast the quality of Chile’s grape varieties and the unique terrain of the long, thin country,” says Dennis. Mid-September also marks Chile’s Fiestas Patrias; a celebration of the country’s independence, which generally lasts about a week. For Alex and Dennis, the dinner makes for great timing. “NOMAD is the perfect space for a Chilean carrete (party) and I’m thrilled Jacqui’s invited me to join her in the kitchen for what promises to be a very fun night,” Alex says. Our dining room can seat up to 50 guests in one section or for the more intimate occasion our semi-private dining room can accommodate up to 20 guests. With our feast and bigger feast menu options you can sit back, relax and enjoy your celebration. NOMAD is available for book outs of the whole space with maximum capacity of 200 guests. Please contact us to arrange your next event. We are fortunate enough to have access to the best wine around this great country and whilst we love to share it with you at our Surry Hills restaurant, we think it's time you were able to access the best at home too. To be part of the Nomad Wine Club, first choose one of our two packs. The Admirer pack offers 3 wines per month to dip your toe into our world of wine. For the more adventurous drinker we offer our Enthusiast pack which offers an additional 3 wines to showcase some of Australia's most exciting and innovative winemakers. Decide which one suits you and then proceed to join the Nomad Wine Club! We pack and send on the first Monday of every month so rest assured your wine needs are covered. No additional delivery fees and temperature controlled from our warehouse to your door. This month we have wines from Tumbarumba NSW, to Great Southern WA and down to Geelong in Victoria. Click here to see this months picks from our team of Sommeliers from Nomad Restaurant. And you can see here and here what they're saying about us. 1 Preheat oven to 120˚C. 2 In a hot pan seal the lamb shoulder until dark golden brown and place in a deep baking dish. 3 In the same pan add the onion, garlic, celery, carrot, thyme and parsley. Cook out until aromatic and golden then add to baking dish. 4 Season the lamb well, pour the olive oil over and cover with hot water. Cover dish and cook in oven for approximately 6 hours or until tender and falling off the bone. 5 Once cooked, remove from oven and allow the shoulder to rest in the cooking liquid for about 30 minutes. 6 Remove the shoulder from the liquid and shred the lamb from the bone being careful not to break the lamb down too far, you want to maintain some texture in the finished product. 7 Fold the caramelised onions through the lamb mix and season to taste. 8 Line a tray with baking paper and press the lamb into the tray approximately 3cm thick, refrigerate. 9 Once chilled, remove lamb mix from tray and cut to desired size and shape. 1 While the lamb is cooking, heat the olive oil in a heavy based saucepan. 2 Add garlic, onions and thyme and cook out over a high heat until the onions begin to release liquid. 3 Once this happens add the vinegar, red wine, raisins, sugar, salt and pepper and reduce the heat. 4 Cook onions out for approximately one hour or until reduced and caramelised. Take care to continuously stir as they tend to catch on the bottom of the pan. 5 Once cooked, remove from heat and set aside. 1 Pierce eggplant all over with a fork. 2 Either on a BBQ or gas burner, cook eggplant directly in the flame until soft. 3 Once cooked, remove from heat and allow excess liquid to drain in a colander. 4 Once cool, peel skin and gently tear flesh being careful not to break down too far as you don’t want the finished product to be too mushy. 5 Place the eggplant in a bowl, add the garlic, vinegar, olive oil and seasoning and gently mix to combine. Leave at room temperature until required. 1 Preheat oven to 210˚C. 2 Brush filo pastry liberally with clarified butter and wrap lamb tightly. 3 Brush a second sheet of filo pastry with butter and, alternating sides wrap the lamb again. Repeat with a third sheet of filo pastry. 4 Repeat this process with the rest of the lamb then place on a flat tray lined with baking paper. 5 Bake for approximately 12 minutes or until golden brown. 6 Serve pastilla with a good spoonful each of the tahini yoghurt and pickled eggplant. 7 In a bowl combine pomegranate, chervil, chives, lemon juice and olive oil. Gently mix until herbs are well dressed then spoon over the pastilla. We are pretty chuffed to be featured in The Urban List - The Best Spots to Dine Alone in Sydney. "Calling all wine connoisseurs, Nomad is your soul mate. This Surry Hills dining scene brings the best of Australian wine, produce and design in a laid back yet charming atmosphere. Pop yourself down at the bar and fill up on a few small plates like the kingfish ceviche with avo and lime, and the duck and pork rillettes on brioche, or tackle something larger like the BBQ spatchcock. Nomad is the perfect reward for a solo diner’s hard-earned promotion, tough session at the gym, or for just making it to Friday in one piece (sometimes it’s the little things)." You can see who else made the cut here. With seating around our central open kitchen where you can see the chefs at work creating your feast before your eyes. Or chat to our bartenders whilst they create a cocktail (or two!) at the bar. These guys are best placed to run you through our all Australian wine list, with most of our wines available by the glass, we're sure you'll find some juice to suit your taste. Or watch the passers by on this quintessential Surry Hills street and the sunsetting at our window counter. Long before Nomad opened, we bought our 2 big beautiful Botti. Searching out these big guys we were after barrels with a history, a story behind how they came to live at 16 Foster Street Surry Hills. At our entrance we have two 10,000 litre wine called 'botti' (which is the plural of 'botte' singular). Botti can be found in wineries all over the world, but they're most often associated with traditional, somewhat old-fashioned Italian wine making, particularly in Piemonte. That said, you'll also see them frequently in Alsace and the Southern Rhone. Historically, almost all botti were made in Slovenia. New botti are breathtakingly expensive and will be used for decades at least, if not a century. Our botti are over 100 years old - we're not sure exactly how old, but they're certainly geriatric. They were in fact made in Australia from German oak. We bought them from Paul Osicka Wines in Heathcote, who it turn bought them from Seppelts back in 1975. If you do get the chance, this is such a beautiful part of Australia! Add Beechworth, King Valley and Rutherglen to your "Northern Victoria wine region must go to list" and Myrtleford because it is so so beautiful. During the build process of opening Nomad, we would constantly debate what to do with the wall at the front of the restaurant. Opening date was fast approaching and we were still searching for the right artwork/design/feature/anything that worked in the space. It got to the point where we were prepared to open with a blank white wall and would wait to find the right piece. Lamenting as I would to David Park from Maud who was in charge of our NOM A D branding, he suggested an artist he knew from Brisbane. It was love at first sight! I'm sure not the phone call one expects when working on fashion drawing ("What do you think of coming down to Sydney to draw a 3m long pig skull for a restaurant?") CJ Hendry flew in, worked day and night to get her work to the framer in time for our opening and stayed to celebrate opening night. 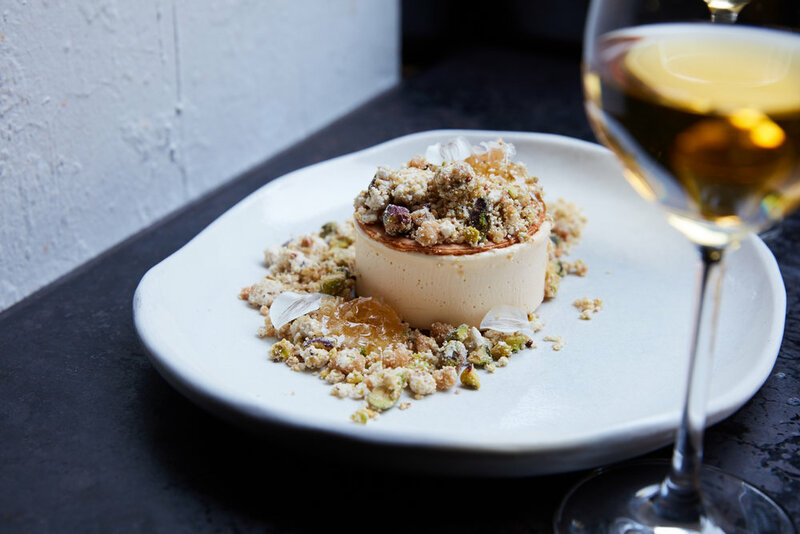 Their relationship has always revolved around food and wine, but how did Al and Rebecca Yazbek create NOMAD and turn it into one of Sydney's most popular restaurants? See their thoughts on merging life and business. Female winemakers are crafting some of the finest wines in Australia. GT Wine raises a glass to the leading women in the industry. We were proud to host the "leading ladies of wine" dinner at NOMAD with GT Wine.